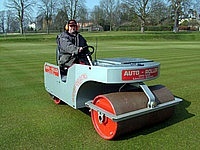 To support groundsmen, the following cricket grounds maintenance calendar has been supplied courtesy of Pitchcare.This calendar should be used as a guide only. With a mild winter being experienced by many so far, and below average rain fall in some parts, January's weather can be fairly unpredictable, with snow, rain and freezing temperatures that are not always conducive to your planned winter maintenance regimes. Many grounds may well be saturated, preventing you from doing any work to the square or the outfield. February sees the beginning of a number of activities such as, brushing, verti-cutting, mowing, light rolling and fertilising to prepare the sward/grass surfaces for the forth-coming playing season. After a harsh winter of snow and frosts, the key to these activities is timing as each operation is weather dependent. As we move out of winter, and with spring just around the corner, we are hoping the worst of the winter weather is behind us. With the increased daylight hours, milder weather and warmer temperatures, this should stimulate some much needed grass growth. After a winter of snow, rain and freezing temperatures it is surprising how quickly the weather can change and influence ground conditions. With spring on its way and summer just around the corner, soil temperatures will soon begin to rise, stimulating some much needed growth. April has provided us with one of the driest months on record for 50 years, in some parts of the UK, promoting ideal conditions for pre season rolling, pitch preparations and out field maintenance. Ironically though, this unusually dry spell of weather does have cause for concerns. We should now be well into the cricket season, with ground staff working hard to produce quality playing surfaces for their clubs. 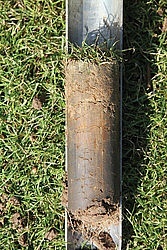 The recent hot sunny weather and drying winds may certainly have had an affect on the square, rapidly drying out the playing surfaces and, in some cases, cause some severe cracking of the soil profiles. 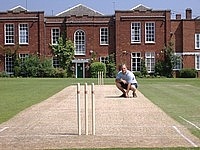 July is seen as the busiest time of the season as we approach the half way stage, with renovations and pitch preparations in full swing; July should, hopefully, provide some favourable soil and air temperatures to finally promote some decent grass growth and, more importantly, give you the drying weather to help prepare firmer wickets. July was certainly a testing month for many groundsmen with the weather dictating the extent of works required. Many parts of the country were experiencing extreme weather fronts, with some areas experiencing drought conditions whilst others were having heavy thundery showers. 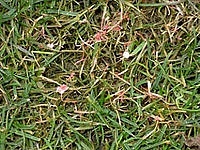 Heavy morning dews can mean your sward stays wet for longer periods, making it vulnerable to attack fro Fusarium. 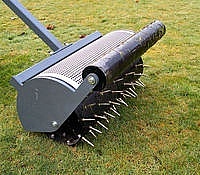 Brushing this regularly will help remove as much moisture from the plant, controlling the disease. Prevention is better than cure, so spray when possible. Key things to keep an eye on during October will be night time temperatures, humidity and periods of leaf blade wetness. This month could swing either way from prolonged dry spells dry patch to wetter days. Winter is an ideal time for getting many repairs to the ground completed. Scoreboards, practice net posts and fences around the ground can be repaired, painted or stained. Depending on ground conditions, some clubs may be able to complete drainage or reconstruction works during the winter months.